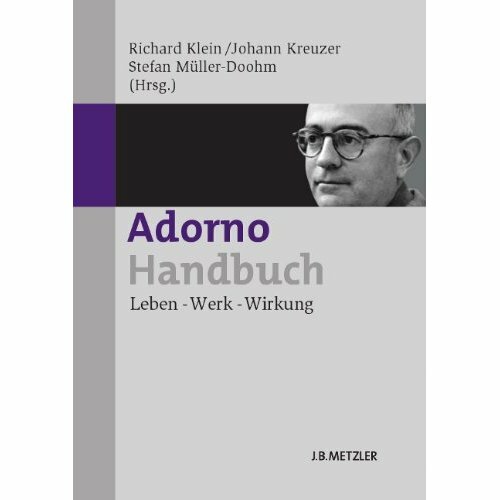 "This handbook offers an overview of the state of debate on Theodor W. Adorno’s work and impact and provides content-related as well as methodical tools for dealing with this prominent figure of 20th-century German-language humanities and social sciences. The objective of this undertaking, on the one hand, is to document and take stock, but also to pass criticism and reinterpret; rather than disseminating a codified doctrine it is aimed at depicting and analyzing the problems and different methods of reasoning exemplified by Adorno himself. At the core of this handbook lies the specifically interdisciplinary character of Adorno’s manner of doing philosophy the potential of which is not limited to philosophy-related research but becomes virulent in the critical interlacing of the arts, music, philosophy, and the academic sciences. 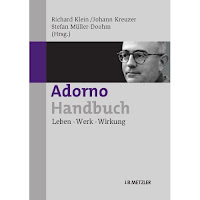 This leaves no room for doctrinal limitations, on the contrary – the handbook’s more than 40 contributors demonstrate the different approaches and temperaments in discussing Adorno´s work". Zeittafel, Vorlesungen und Seminare, Bibliographie. Richard Klein is editor of the journal "Musik & Ästhetik". Johann Kreuzer is Professor for History of Philosophy and Head of the Adorno Research Centre, Carl von Ossietzky University, Oldenburg. Stefan Müller-Doohm is Professor Emeritus for Sociology, Carl von Ossietzky University, Oldenburg. Any murmurs of an English translation?